1. How long have you been knitting or crocheting? How did you learn? or from whom? Since I was 19. From a class at StitchDC. 2. What was your first felted object, and why did you decide to try felting? A felted needle case. I wanted to have a place to stick my needles, so I decided to try my hand at felting. 3. What are your favorite colors? Any you hate? Earthy colors — blues, greens, browns. I hate yellows and oranges. I love totes with long straps so I can throw them over my shoulder. Anything with a good amount of room makes me a happy girl. 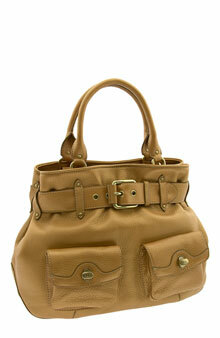 I love big bags, so that’s really the main thing, not so much the length of the handles/straps. I’m happy with any kind of decoration. I haven’t gotten to embellished until my mom’s Christmas present this year, but I think it’s going to turn out looking FANTASTIC! I think the French Market Bag [ here! ] off of Knitty is also a great bag. 5. What handbag or bag are you carrying today? Do you use a separate bag to carry your knitting? Isn’t it just fantastic?! Anyways, if I’m not carrying that — since it holds the world inside of it, I go for a tote bag to hold the knitting along with my purse. 6. What other things do you enjoy knitting or crocheting? Socks, lace, and of course any hats, scarves or mittens! I’m a big circular needle fan, and I’m sticking with aluminum right now since it’s all I can afford. If I had my way, I’d be all over the addis I truly love. 8. What’s one project you’ve not yet tried but are dying to make? The French Market bag that I talked about up there! A friend of mine knit it at our circle and I fell in love with it and now I’m dying to make one myself! 9. What’s one yarn you’ve not yet tried but are dying to work with? I’m not sure there is one! 10. What other hobbies do you have? Do you spin? Sew? Garden? No, I don’t think there’s anything else that would go under this category that I love to do as much as I love to knit. 11. Besides yarn, do you collect anything? 12. What kind of goodies do you enjoy? Sweets? Salty? Anything you hate or are allergic to? I’m not a big chocolate or licorice [ sp? ] fan, so pretty much anything else. I have a dog and cat. 14. What kind of project best personifies you and why? Socks — I’m funky and fun and that’s what I think of when I think of knitting a pair of socks. 15. What is your favorite part of Autumn? You can also share a special Autumn memory if you’d prefer! 16. Tell us 3 things you would do if you won 10 million dollars in the lottery. Add to my IRA, buy a house, take a fantastic vacation.